areas of the county was created. Six areas were identified to be covered in three phases of the broadband expansion project, based on criteria such as, number of potential customers, likelihood of other private broadband providers extending service to the areas, potential cost to reach the areas, etc. 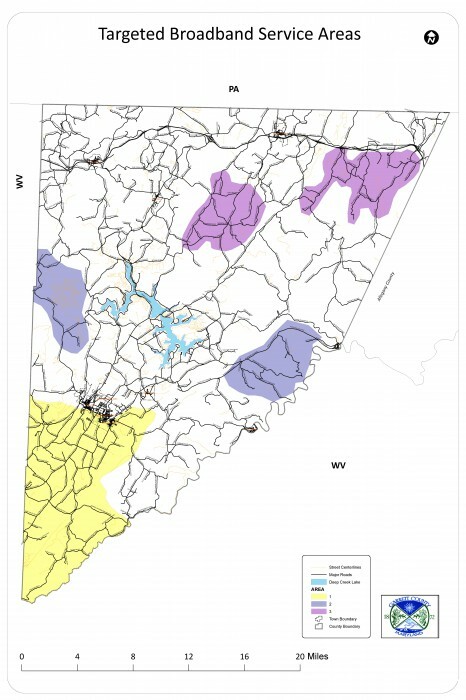 The map at right guided the project related to three Appalachian Regional Commission (ARC) grants that the county is using to provide service in these areas. The county's private partner, Declaration Networks Group (DNG) has plans to provide service in additional areas of the county with private investment. For instance, in 2018 DNG received both a USDA RUS Grant and Loan to cover additional areas of Garrett Counties, and to build out some of the ARC areas more fully. The map below approximately shows the two areas (yellow and blue) to be covered with those funds.